The GDELT Analysis Service offers a variety of tools and services that allow you to visualize, explore, and export the Global Database of Events, Language, and Tone (GDELT) project - a realtime database of global society. 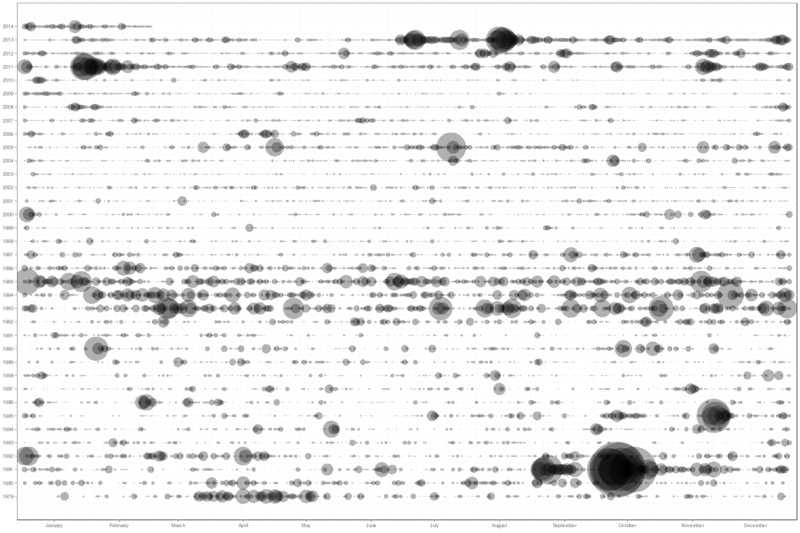 Rapidly export small subsets of event records for further analysis, visualization, or other use. Intended primarily for advanced users with event data experience. Creates a geographic network of the cities and landmarks connected through events and produces a set of images and georeferenced network files. Creates an interactive heatmap of event distribution that displays in a browser window, along with a CSV file for importing into GIS software. Creates a unique gridded timeline showing intensity by day of matching records - Y axis is year and X axis is day, making anniversary behavior instantly visible. Creates a timecoded Google Earth .KML file that allows you to visualize change over time and space, as well as a .CSV file for importing into GIS software and web mapping services. Creates an interactive network diagram that displays in a browser window, a spreadsheet of the most important "influencers" and a .GEXF file for analysis in Gephi. Creates an interactive heatmap of spatial affinity that displays in a browser window, along with a CSV file for importing into GIS software. Creates a unique gridded timeline showing intensity by day of each country in a search - Y axis is day and X axis is each country, making correlations among countries instantly visible. Searches all GKG records and returns matching GKG records and a list of source URLs. Intended primarily for advanced users with extensive scripting experience. Creates a geographic network of the cities and landmarks most closely associated with a search and their co-occurances and produces a set of images and georeferenced network files. Creates a beautiful publication-ready "word cloud" visualization of the top entries of a given GDELT GKG field from a given search and .CSV file. Creates a timeline of the smoothed average tone by day of a search, along with a CSV file for importing into external software. Creates a unique gridded timeline showing intensity by day of each GKG theme - Y axis is day and X axis is each GKG theme, making correlations among themes instantly visible. GDELT is an initiative to construct a catalog of human societal-scale behavior and beliefs across all countries of the world, connecting every person, organization, location, count, theme, news source, and event across the planet into a single massive network that captures what's happening around the world, what its context is and who's involved, and how the world is feeling about it, every single day.